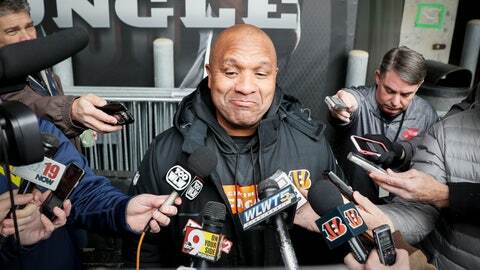 CINCINNATI (AP) — Bengals coach Marvin Lewis shut down the question immediately, making it clear he won’t be talking about the latest addition to his staff — one who’s in an unusual position to influence the next game. Only last month, Hue Jackson was Cleveland’s head coach, intimately involved in the Browns‘ game planning. Now he’s on the Bengals sideline with Lewis, trying to beat the Browns — a sensitive subject that the head coach is trying to put off limits. Oh, no. The intrigue is just getting started. The Bengals (5-5) desperately need to beat the Browns (3-6-1) at Paul Brown Stadium to remain relevant in the playoff chase. They’ve lost four of five , fired their defensive coordinator and installed Lewis as leader of a historically bad unit. As part of the shuffle, he brought back a close friend at an opportune time. Jackson was fired by the Browns on Oct. 29 after winning only three games in three seasons. Lewis brought him back to Cincinnati for the third time , creating a role of special assistant. Jackson helps develop the weekly game plan on defense and provides tips on the sideline during games. His input will be especially useful this week. Jackson knows the Browns’ tendencies and the players’ strengths and weaknesses. It’s not unusual for a team to pick up a player who was released by an upcoming opponent, but it’s highly unusual to get the other team’s former head coach. One more unique feature to this intrastate matchup: Both head coaches will be calling the defensive plays. Defensive coordinator Gregg Williams was elevated to interim coach after Jackson was fired. Lewis took over the defensive coordinator duties after Teryl Austin was fired on Nov. 12. It’s challenging to analyze what the opposing offense is doing and adjust defensively while also running the overall game. That’s where Jackson’s presence could be especially helpful on Sunday. The Browns are coming off a bye week that gave them a chance to add a few things that Jackson won’t anticipate. Jackson jogged off the practice field on Wednesday and declined to stop and talk about his reunion with Cleveland, referring questions to the closed-lipped Lewis. Receiver A.J. Green could return against Cleveland. He’s missed the past two games with an injured toe on his right foot, and the offense struggled in losses to the Saints and Ravens . Green didn’t practice Wednesday, but Lewis said he will work out the rest of the week, aiming to be ready by Sunday. Left tackle Cordy Glenn (back) and cornerback Dre Kirkpatrick (shoulder) also missed practice. Defensive end Michael Johnson (calf) and safety Shawn Williams (hamstring) were limited. The Bengals figured they’d upgraded their linebacker group when they signed durable Preston Brown from Buffalo in the offseason. He was limited by a right ankle injury that he suffered the first game, and he injured his right knee during a 51-14 loss to the Saints. The Bengals put him on injured reserve Tuesday and signed defensive end/linebacker Kasim Edebali, a college free agent who has played with the Saints, Broncos, Lions and Rams. Lewis said Brown might have surgery on his ankle now that he can’t return this season.